[S182] Social Security Death Index (on-line), Ancestry.com, SSDI, Ancestry.com, SSAN 040-42-2223. Sidney Duane Shattuck was born on 7 June 1903 at Granby, Hartford Co., CT. He was the son of William Shattuck and Jessie Alice Holcombe. Sidney Duane Shattuck died on 30 May 1921 at age 17. Granville Shattuck was born on 21 June 1909 at Granby, Hartford Co., CT. He was the son of William Shattuck and Jessie Alice Holcombe. Granville Shattuck died in 1980. Rodney Ambrose Shattuck was born on 15 September 1915 at Granby, Hartford Co., CT. He was the son of William Shattuck and Jessie Alice Holcombe. Rodney Ambrose Shattuck died on 24 October 1932 at age 17. Armenus Messenger was born on 27 May 1833. He married Eliza Clark. Armenus Messenger died on 31 January 1887 at Granby, Hartford Co., CT, at age 53. Eliza Clark married Armenus Messenger. Richard Shattuck Farmer was born on 21 January 1933. He was the son of George Melvin Farmer and Corinne Coleman Shattuck. Michael William Snow was born on 17 March 1972. He was the son of Rodney William Snow and Jane Cynthia Leighton. Milton A. Holcombe was born on 21 April 1793 at West Granby, Granby, Hartford Co., CT.3 He was the son of Nahum Holcombe and Rebecca Moore. Milton A. Holcombe married Roxanna Wilcox, daughter of Sadoce Wilcox and Roxy Hayes, in April 1818. Milton A. Holcombe married Mary Raymond Adams in 1854. Milton A. Holcombe died on 11 November 1868 at age 75. He was buried at Hayes Cemetery, Burghill, Trumbull Co., OH. Milton served as a Corporal in Isaac Phleps' command in the War of 1812 from Aug 18, to oct 25, 1814; moved in 1832 from Granby, CT to Farmington, Trumbull Co., OH, having lived also in Hartford, in Trumbull in 1850 where and when he was recorded in the census as a farmer, owning real estate. Milton and Roxanna were enumerated in the 1850 Hartford, Trumbull Co., OH, federal census. He was a farmer, age 57, she was 55. Children in the household were Adaline 25, Amelia 18, and Hester Ann 12. There were two other children, Emery Dillitt 11, and George Dillitt 6. Milton and Mary were enumerated in the 1860 Hartford, Trumbull Co., OH, federal census. He was a farmer age 67, she was 56. Children in the household were Amelia 29, and Esther A. 21. [S23] Jesse Seaver, The Holcomb(e) Genealogy, Page 88/Item 246.1. [S25] Hannah McPherson, Holcombe Genealogy, Page 125.2/Item A-8-1-2-6-6-1. Roxanna Wilcox was born on 13 April 1794. She was the daughter of Sadoce Wilcox and Roxy Hayes. Roxanna Wilcox married Milton A. Holcombe, son of Nahum Holcombe and Rebecca Moore, in April 1818. Roxanna Wilcox died on 14 March 1853 at Hartford, Trumbull Co., OH, at age 58. She was buried at Hayes Cemetery, Burghill, Trumbull Co., OH. Susannah Holcombe died young. She was born on 17 August 1754 at Simsbury, Hartford Co., CT.1 She was the daughter of Reuben Holcombe and Susanna Hayes. Mary Raymond Adams was born circa 1803 at OH.1 She married Milton A. Holcombe, son of Nahum Holcombe and Rebecca Moore, in 1854. The Holcombe genealogy lists 10 children, an "Alonzo" as the first child. The Andrew Moore Genealogy does not list Alonzo, but both list a Chester Alonzo. It seems obvious that "Alonzo" is Chester Alonzo as there is not time between the marriage of Fidelia and Chester and the birth of Lucella for another child. [S25] Hannah McPherson, Holcombe Genealogy, Page 126.2/Item A-8-1-2-6-6-2. Chester and Sarah were enumerated in the 1850 Granby, Hartford Co., CT, federal census. He was a farmer age 58; she was 49. Children in the household were Emerson 9, and Marshall 3. Chester and Sarah B. were enumerated in the 1860 Harwinton, Litchfield Co., CT, federal census. He was a farmer, age 68; she was 60. The only child in the household was Emerson, 19. [S25] Hannah McPherson, Holcombe Genealogy, Page 145.2/Item A-8-1-5-1-5-6. [S66] Mark Williams Granby VR, Vol. II:Pg. 253. [S164] Carol Laun, Holcombe Collection, Page 76. Milo Holcombe was born on 22 May 1803 at West Granby, Granby, Hartford Co., CT. He was the son of Nahum Holcombe and Rebecca Moore. Milo Holcombe married Orpha Parsons. Milo Holcombe married Rachel (?) at Iowa. Milo Holcombe died in 1838 at Iowa. This is probably the Milo Holcombe that was an early pioneer in Washington Co., IA, in the southern part of the county near the Henry County line. He and John B. Bullock built a mill on Crooked Creek as early as 1837. [S25] Hannah McPherson, Holcombe Genealogy, Page 129.1/Item A-8-1-2-6-6-6. Franklin Holcombe was born on 28 April 1819 at Granby, Hartford Co., CT. He was the son of Milton A. Holcombe and Roxanna Wilcox. Franklin Holcombe married Mary Jane Bidwell, daughter of Wayne Bidwell and Sarah Cone, on 28 January 1823. Franklin Holcombe died on 12 July 1859 at age 40. These dates are a little suspect, Frank was 3 when he married Mary. Michael C. Holcomb suggests a marriage date of 1843. F. and M.J. were enumerated in the 1850 census of Gustavus, Trumbull Co., OH. He was a farmer, age 31; she was 27. Her mother Sally Bidwell was also in the household as was an 8 year old girl Marilla Halstead. She is apparently not a child of Franklin's, but perhaps a child of Mary Jane by an earlier marriage? Mary Jane was enumerated in the 1860 Gustavius, Trumbull Co., OH, federal census. She was a farmer age 37. In addition to Marilla, a son Charles, age 6, and Mary Janes' mother Sally (who seems to get younger every census) were enumerated in the household. Mary Jane was a generous kind Methodist church woman. [S23] Jesse Seaver, The Holcomb(e) Genealogy, Page 88/Item 246.1.I. [S25] Hannah McPherson, Holcombe Genealogy, Page 125.2/Item A-8-1-2-6-6-1-1. Mary Jane Bidwell was the daughter of Wayne Bidwell and Sarah Cone. Mary Jane Bidwell married Franklin Holcombe, son of Milton A. Holcombe and Roxanna Wilcox, on 28 January 1823. Webster and Harriett were enumerated in the 1850 Hartford, Trumbull Co., OH, federal census. He was a farmer age 29; she was also 29, born in Ohio. Children in the household were Daniel I. 6, Emma 5, and Mary C. 1/3. An Esther DeWitt age 10 was also in the household. Webster and Harriett were enumerated in the 1860 Hartford, Trumbull Co., OH, federal census. He was a farmer age 39, she was 38. Children in the household were Paul E. 16, Emma J. 14, Mary C. 10, Clara 6, and Frank 1. Webster and Harriett were enumerated in the 1870 Hartford, Trumbull Co., OH, federal census. He was a farmer age 49, she was 48. Children in the household were Mary C. 20, Clara A. 15, Frank Y. 11, and Nahum 4. Webster and Harriett were enumerated in the 1880 Hartford, Trumbull Co., OH, federal census. He was a farmer age 59, she was 59. Children in the household were Nahum 14, and Clara 23. [S23] Jesse Seaver, The Holcomb(e) Genealogy, Page 88/Item 246.1.II. [S25] Hannah McPherson, Holcombe Genealogy, Page 125.2/Item A-8-1-2-2-6-6-1-2. [S807] Find A Grave, online http://www.findagrave.com, Find A Grave, database and images (https://www.findagrave.com : accessed 9 September 2018), memorial page for Webster Holcomb (20 Mar 1821–4 Nov 1896), Find A Grave Memorial no. 38206759, citing Hayes Cemetery, Hartford, Trumbull County, Ohio, USA ; Maintained by skye (contributor 47137314) . Harriet A. Ducker was born in 1821. She married Webster Holcombe, son of Milton A. Holcombe and Roxanna Wilcox, on 4 January 1843. Harriet A. Ducker died in 1896. 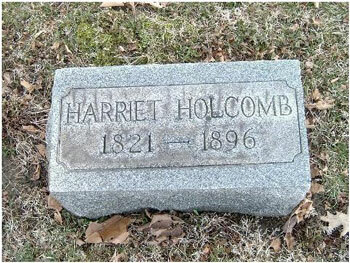 She was buried at Hayes Cemetery, Burghill, Trumbull Co., OH. Asbury Holcombe was born on 18 August 1823 at Granby, Hartford Co., CT. He was the son of Milton A. Holcombe and Roxanna Wilcox. Asbury Holcombe died on 19 October 1841 at age 18. Helen Holcombe was born on 28 September 1825 at Granby, Hartford Co., CT. She was the daughter of Milton A. Holcombe and Roxanna Wilcox. Helen Holcombe died at New London, Henry Co., IA. McPherson indicates that Helen had a daughter Lora, born 1852-53, but does not indicate by which husband. Michael Holcomb lists her as a daughter of Wells Andrews. Edwin and Helen were enumerated in the 1850 Vernon, Trumbull Co., OH, federal census. He was a farmer, age 38; she was 25. There were no children in the household. Wells and Helen were enumerated in the 1860 New London, Henry Co., Iowa federal census. He was a farmer, age 50; she was 35. Children in the household were Asa 19, Nelson 17, Albert 13 (all apparently Wells' children from a previous marriage), Lora 7, and Lovilla 24 born in NY. Adaline Holcombe was born on 12 February 1828 at Granby, Hartford Co., CT. She was the daughter of Milton A. Holcombe and Roxanna Wilcox. Adaline Holcombe married Jacob Y. Secar. Seaver shows Adaline's spouse as Jacob Y. Secar; McPherson shows the spouse as Jacob McLean. [S25] Hannah McPherson, Holcombe Genealogy, Page 126.1/Item A-8-1-2-6-6-1-5. Jacob Y. Secar married Adaline Holcombe, daughter of Milton A. Holcombe and Roxanna Wilcox. Died unmarried. Amelia Holcombe was born on 25 June 1832 at Granby, Hartford Co., CT. She was the daughter of Milton A. Holcombe and Roxanna Wilcox. McKendrie Holcombe was born in 1835 at Hartford, Trumbull Co., OH. He was the son of Milton A. Holcombe and Roxanna Wilcox. McKendrie Holcombe died in 1836. Hester Ann Holcombe was born on 12 June 1839 at Hartford, Trumbull Co., OH. She was the daughter of Milton A. Holcombe and Roxanna Wilcox. Hester Ann Holcombe married Alexander H. Smith on 6 May 1862. 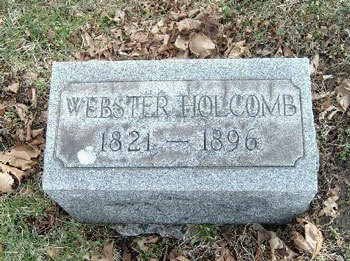 Hester Ann Holcombe died on 15 November 1915 at age 76. [S25] Hannah McPherson, Holcombe Genealogy, Page 126.1/Item A-8-1-2-6-6-1-8. [S104] DAR DAR Lineage book, Vol. 157/Item 156720. Alexander H. Smith was born on 18 March 1832. He married Hester Ann Holcombe, daughter of Milton A. Holcombe and Roxanna Wilcox, on 6 May 1862. Alexander H. Smith died on 4 July 1897 at age 65. Abigail Jane Holcombe was born on 21 January 1829 at Sterling, Worcester Co., MA. She was the daughter of Deacon Augustine Holcombe and Lucy Bush. Abigail Jane Holcombe died on 27 February 1829. Susan Huntington Holcombe was born on 11 March 1830 at Sterling, Worcester Co., MA. She was the daughter of Deacon Augustine Holcombe and Lucy Bush. Susan Huntington Holcombe died on 15 November 1846 at Stockbridge, MA, at age 16.